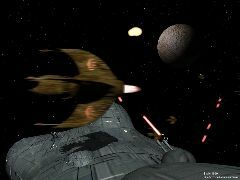 Here are some images directly drawn from the animation or rendered using some Space Battle's meshes. For more informations about the different space ships you will see here, do not hesitate to go to the UNIVERSE section ! You can download some textures I made in the Textures section. NB: You can copy and distribute all these pictures as soon as you do not modify them or sell them ! All these pictures are copyrighted and digitally watermarked. Click on one of these thumbnails to see the full sized image. This picture is drawn from the final animation (but it was rendered in a higher size). 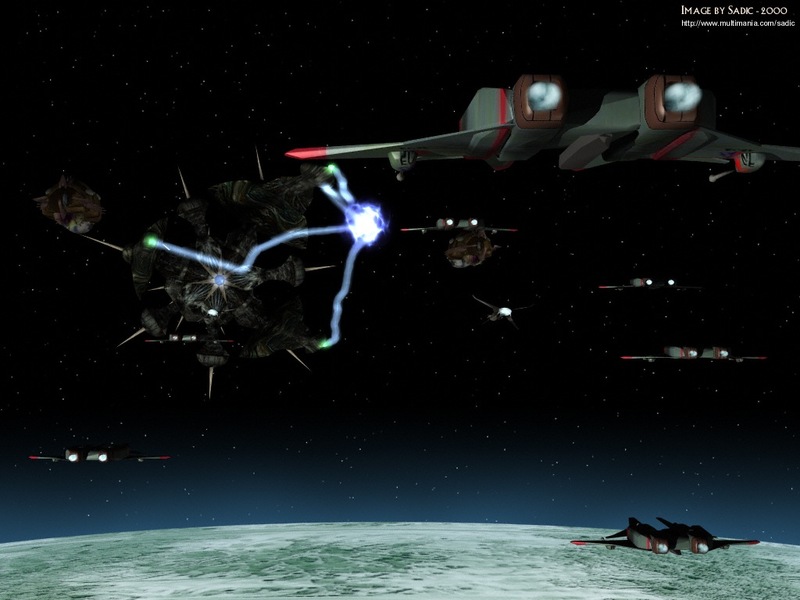 We can see the European Space Fleet shortly before the final battle against the aliens. 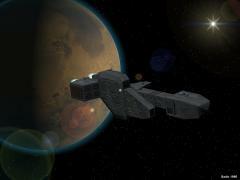 As you can see, there is the ECS Prohecy and two frigates. In fact, the ECS Prophecy design is totaly inspired by the carrier called "TCS Midway" in Wing Commander Prophecy. It is another picture drawn from the animation. The Alien Mothership has just fired and the freighters and distroyed one. The explosion we can see in the background will become bigger bigger and will finally reach the freighter in the foreground before destroying it too. 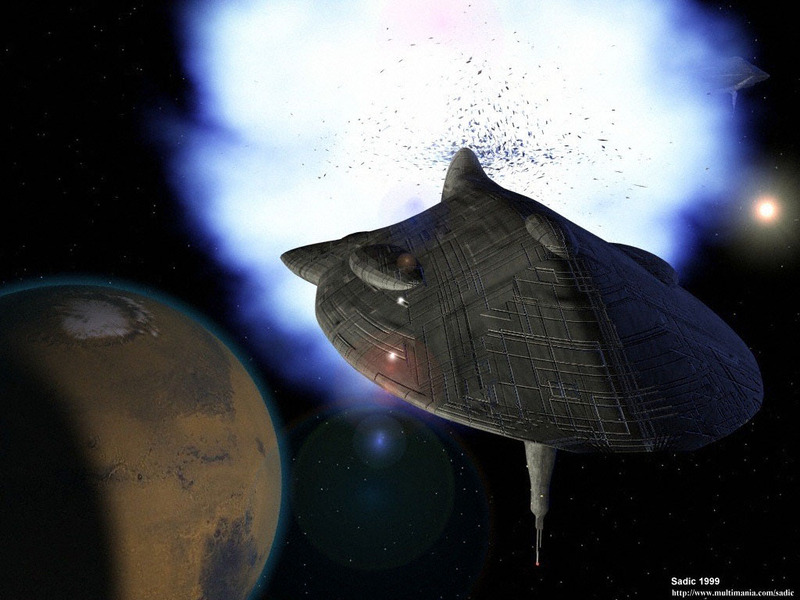 This explosion has been realised using 'Combustion' and the 'Bomb' space warp. Here is the "Vortex" the aliens are using to come in our Solar System. The 'Vortex' (or wormhole) itself is an object on which I mapped an AVI. And this AVI is nothing else than a 3DS's lensflare effect which was animated by changing its phase. 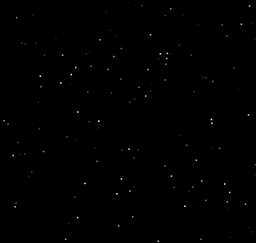 This image appears (but in a lower resolution) in the animation. 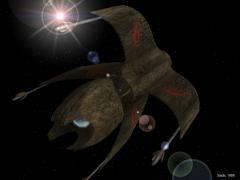 The design of alien mothership exiting the vortex was inspired by the Nephilim Destroyer in the video game "Wing Commander Propehcy". This picture takes place at the end of the animation. 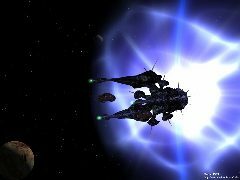 In the foreground, we can see the terran bombers attacking the Alien Mothership and preparing to launch their nuclear torpedoes. In the backgrounds the Alien captital ship is charging its most mighty weapon. Who will shot the first ? 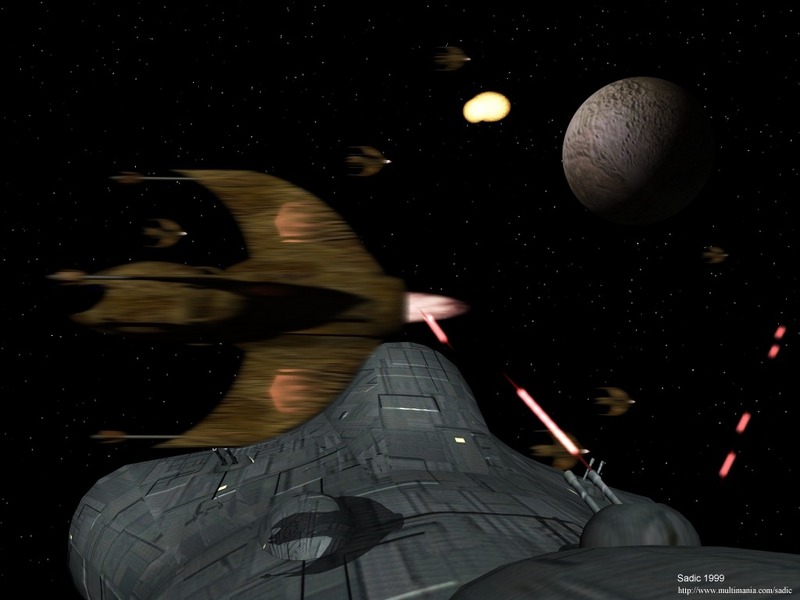 In the action : the two fleet are strugling and the bombers of both sides are attacking the capital ship. 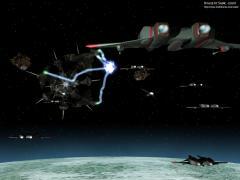 Here we can see an alien fighter flying over a frigate of the European Space Fleet managing to shoot it down. Here we are inside of a human fighter. This pilot is trying to lose a bandit which is in his six. He will now fligh through the core of the human amiral spaceship : the ECS Prophecy (see picture below). 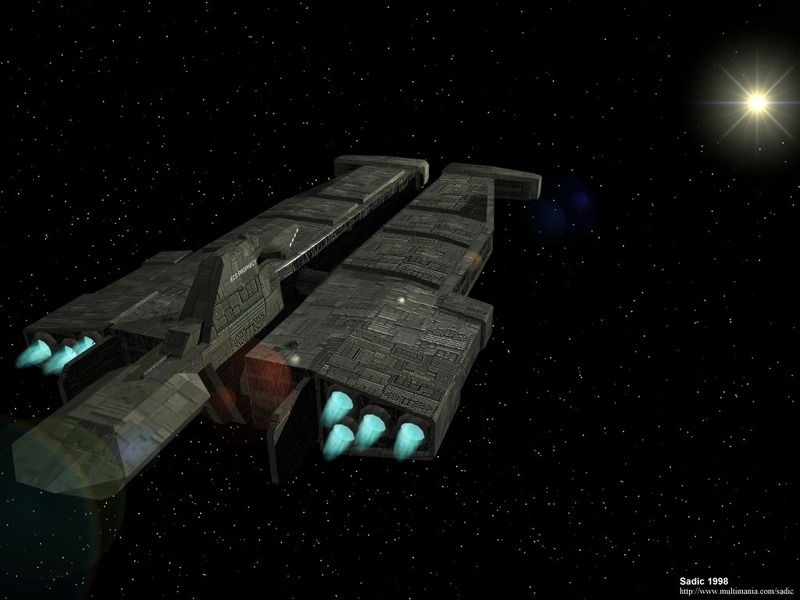 Here is the "ECS Prophecy" carrier, inspired by the "TCS Midway" from Wing Commander Prophecy. 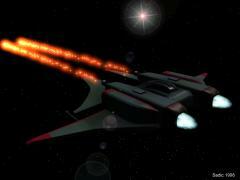 This is the main spaceship of the human fleet. 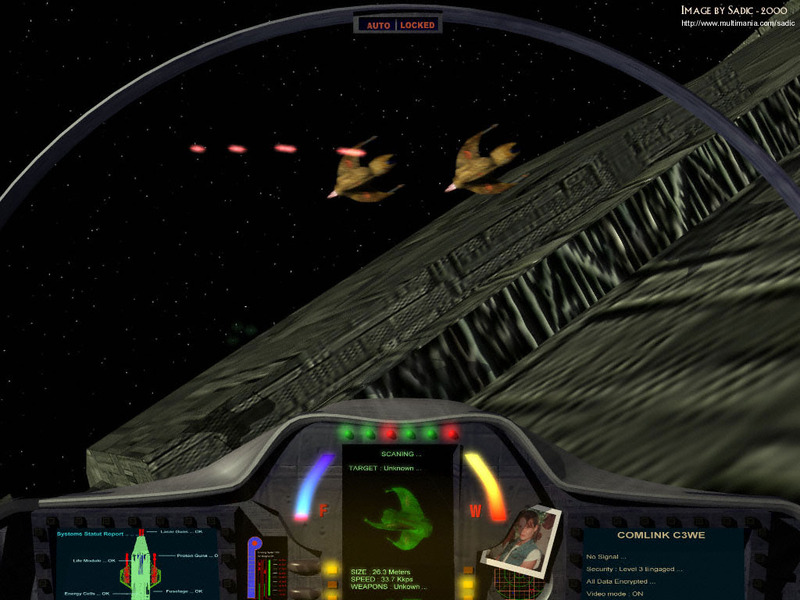 Some of the textures were drawn from the game (by screen capture), then retouched with Paint Shop Pro. This is the alien Fleet. 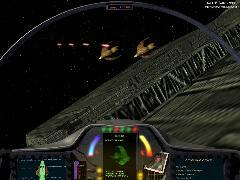 You can see the alien MotherShip, inspired by a spaceship of the game Wing Commander Prophecy. Like the previous scene (the "ECS Prophecy") the textures are screen captures of the game with a lot of bump. The nebula is Orio, and the planet is Charo, which map has been downloaded at the NASA's site. This is the bomber shooting with its machinegun. The effect has been made by applying a LensFlare on a particules spray. The Sun is a LensFlare too and the engine burst has been created with the combustion plug-in. 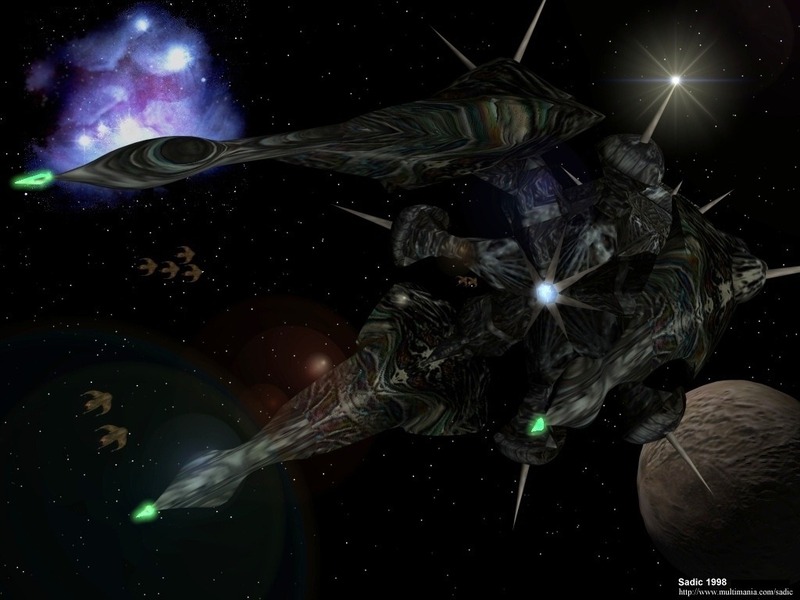 This picture shows an alien heavy fighter. This is the only non-capital alien ship of my animation. The texture is a photo of human skin, which has been modified with Paint Shop Pro. I used a glowing effect to obtain the "crystal" in the center of this spacecraft. 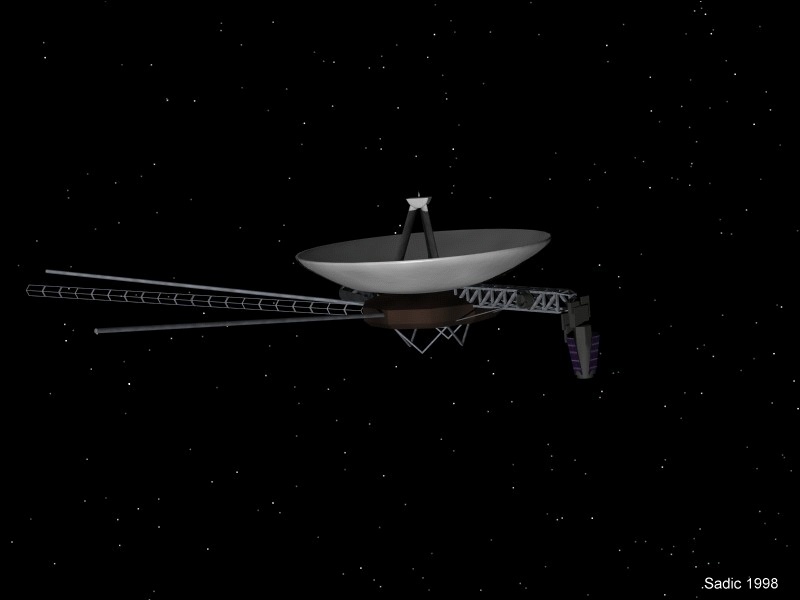 Here is an approximative meshe of Voyager 2. Why is it approximative ? Well, because I only found very small pictures of this probe and all these pictures were different. So I could not know the exact form of Voyager. 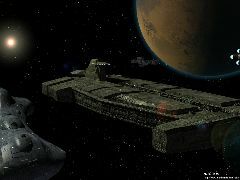 Voyager appears in the opening sequence of Space Battle.